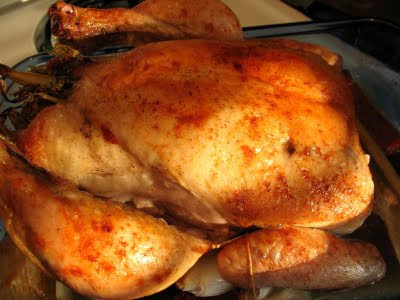 I love roast chicken on a fall or winter day. It's so easy, and the rewards are always delicious. They somehow seem so much simpler than turkey-maybe it's because you aren't wrangling with a massive bird, or have the pressure of a lot of other side dishes to go with it. The other day I roasted up a bird and our dinner was simply salad, roasted chicken, and a bit of rice pilaf-nothing fancy or complicated, but just downright homey and delicious. Clean out your chicken, then pat it dry all over. Rub the skin all over with the olive oil and sprinkle with salt, pepper, and paprika. Stuff the cavity with 2 pieces of onion, some lemon, a couple pieces of celery, garlic, and the herbs. Truss up the bird so the legs stay closed. Since I don't have a roasting pan, I use the remaining veggies to create a "nest" for my bird to sit on. Arrange the celery, lemon, onion, carrot and garlic in the middle of the pan for the bird to sit on. Pour about 3/4 cup of wine or chicken stock into the pan. Stick your meat thermometer into your bird, cover it up with aluminum foil, and put it in a 350 F oven. If you like to eat the skin and want it crispy, then don't cover the bird up. We never eat the skin so I do cover it for most of the time it's roasting. Roast for about 2 hours, or until your thermometer says it's done. I always slice wiggle a leg and then slice it to see if the juices run clear or if they're still bloody. When they are clear, the bird is done! Let it sit for a good 15 minutes or so to rest before you carve the baby up. Here's a great video for how to carve a chicken.